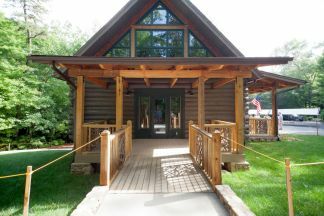 Last November, WNC Communities was selected by Commissioner Steve Troxler of the NC Department of Agriculture & Consumer Services to complete and “up fit” a handcrafted log building in the DuPont State Forest located at the High Falls Access Area on Staton Road in Transylvania County. The project was funded through TVA Settlement Funds and the goal was to finish the facility and turn it into a venue for educational programs and serve as a gateway to 10,400 acres of the forest that contain 80 miles of multi-use trails and spectacular waterfalls. In January, it was announced the facility would be named after long-time supporter, volunteer and staunch advocate, Aleen Steinberg. A native of Wisconsin and a former resident of Florida, Steinberg spent summer vacations with her husband and children in Cedar Mountain and came to know and love the forest when it was still owned by the DuPont Corporation. She was one of 22 local individuals who came together 13 years ago to prevent the central portion of the forest from being developed into a gated, luxury community after the manufacturing plant closed. Construction started in the winter. You can view a journal of photos following the progress on this amazing project: Aleen Steinberg Center construction. On July 1st over 200 leaders from NCDA & CS, NC Forest Service, area counties, tourism, friends and volunteers witnessed the dedication ceremony and ribbon cutting to formally open the Aleen Steinberg Center. LT Ward, VP of WNCC, shared a “fairy tale” to aptly describe the people and passion behind this project. To read the forest fairy tale in its entirety, click here. In addition, there is a diorama being designed by the Apple Valley Model Railroad Club. Plans are for the diorama to be installed at the ASC in October. To see a video of this upcoming addition click here.